Unique children's music with a Big Band sound. The fun part comes from the Latin beats and crazy humour. Quality get happy music for the whole familiy. 9. What's Cooking Double Booking? 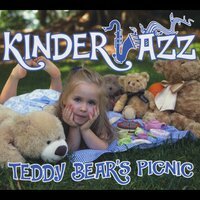 KINDERJAZZ born in 1997 and managed by Christobel Llewellyn, is the only 12 piece live Big Band for children in the world. Most of our musicians have been with us since that time and Teddy Bear's Picnic was recorded in an amazing 4 hours.. This means that all of the tracks are LIVE and mostly FIRST TAKES. It will match the energy of any youngster. We recorded at James Morrison's Studio and the sound is exceptional. We love what we do and want you to love it too. If you want get your children interested in quality music, this is the band to do it. Trumpets, trombones, saxophones, singers, drums,piano, double bass, latin percussion. It's sunshine. All the music skips the first beat which means your children will learn to wait and also learn to improvise without even trying. All you have to do is listen. It's Glenn Miller meets Sesame Street! You'll sing, you'll dance, you'll laugh, you'll learn about the instruments and most of all you'll have fun!